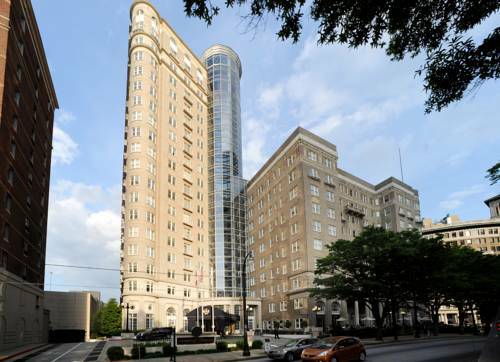 Experience the best in Midtown Atlanta Hotels The Georgian Terrace Hotel is a modern icon among Atlanta hotels. A Midtown icon the Georgian Terrace Hotel is located in the heart of Atlanta business and cultural district across from the Fox Theatre. The hotel delivers a brand of service rarely found even in the South. We are set to please with everything from big modern suites to versatile event and meeting spaces. Our business facilities are state of the art. We offer a world-class conference center an impressive boardroom plus classic ballrooms and secure onsite parking. Just off our lobby Livingston Restaurant and Bar serves award-winning American cuisine. A Midtown icon the hotel is located in the heart of Atlanta business and cultural district across from the Fox Theatre. We are set to please with everything from big modern suites to versatile event and meeting spaces. Our business facilities are state of the art. We offer world-class conference center impressive boardrooms plus classic ballrooms and secure onsite parking. Just off our lobby Livingston Restaurant and bar serves award-winning American cuisine. FRESH as in fresh pastries freshly brewed Starbucks teas and coffee drinks the fresh local ingredients in our salads Paninis and sandwiches. FRESH as in our eco-light packaging.Your morning Starbucks coffee stop or lunch al fresco on our terrace. Livingston Restaurant and Bar in Midtown Atlanta inhabits one of the city few historic buildings. Enjoy cocktails conversation and cutting edge cuisine. Meet early for cocktails and a light supper or settle in at the restaurant for a four-course evening. The Mitchell Ballroom is a 960 square foot ballroom featuring a corner rotunda with chandelier. It can accommodate 80 people for a reception, and 120 people theatre-style seating for corporate events.